I am not sure it was adventure that drove my ancestors to undertake life-changing journeys. More probably it was poverty and the search for greener pastures that got my grand-grand-grandfather to move from Lika to Cazinska Krajina; his son to Matrici, a village near Kozarac; and my grandfather to Prijedor. There clearly was a pattern of non-acceptance of the status quo, of readiness to pack up the tent and leave in the hope of finding something better, but it is hard to say if thirst for adventure had anything to do with it. That particular gene surfaced in all its glory with the next generation. And if there was a personification of it in the family, it was my uncle Refik, whom I was named after. Born as the fourth of seven Hodzic brothers, Refik was never reconciled with living a harsh life in a small Yugoslav village struggling to recover from the devastation of the Second World War. It was 1955, he was 17 when he talked his oldest brother Dzemal and a couple of cousins to leave Matrici and try their luck somewhere else. Leave yes, but where? Anywhere, as long as it was far away from the bleakness of post-war Bosnia, as long as it was distant and unknown. In a remarkable feat, the four trekked on foot to Trieste, Italy. After several days of sleeping rough, running out of the little money and food they packed, the three older cousins started having second thoughts about the whole undertaking. One of them turned back, while Dzemal argued they should try to find some work in Trieste and stay there. Refik had other ideas. He met a Slovenian sailor who had just disembarked a ship that came from North Africa, where UNHCR had a large camp, a transit point for repatriation of refugees of the WWII. From there, Slovenian weaved the story, one could catch a break and register for settlement in America or Australia. Refik had no idea what Australia was like, but he knew he had to go. And so it was. Refik, Dzemal and Islam somehow managed to bribe their way on to the ship to Tunis. They would spend a couple months there registered as refugees before getting the papers for Australia. The trip took almost a month. Eventually they made it to Melbourne, where Refik and Dzemal would settle. Two brothers lived in the harbor and worked various jobs before scraping enough money together to lease a bar on the docks with a couple of Irishmen. Business was good, and after a while they moved up and leased a small hotel. Couple of years in, Dzemal would fall in love with Jenny, a gorgeous Kiwi lass. They would move to New Zealand, have three children – Ibrahim, Djula and Djemka – and set up shop there. In 1972, they would come to Prijedor to give it a try at living there. They built a house and all, but their enthusiasm lasted for about a year before they would return to Te Aroha, a town in central North Island of New Zealand whose name in Maori means “love”. Prijedor got its name from the description of violent penetrations of Sana river into the early human settlements on its banks. The choice was obvious. Dzemal and his family provided the permanent bridge between the Hodzic clan and New Zealand, with the youngest brother Abaz joining him in 1980 and my father following in 1986. This link would take on a whole new dimension when Prijedor was engulfed in genocidal horrors of the 1992 and more than 30 Hodzics and satellite families fled Bosnia to Auckland. My children were born there, my father buried in Manukau Cemetary. Refik stayed in Melbourne. He lived as a professional gambler for years, mingling with Australian jet set and for a while dating one of the hottest Australian actresses of the 60s. His name was known in all fancy bars and casinos from Perth to Darwin. I only heard of him at family reunions, in stories told by my father and his brothers, always tinged with envy and subdued pride. Only once he came back, in 1979, to visit his mother Nazifa. I was seven and all I remembered from that visit was his mesmerizing smile and a pet capuchin monkey on his shoulder. The next time I saw him was in 1993, when he came to Auckland to visit the family he hadn’t seen in years. His health was seriously eroded by decades of heavy drinking and sleepless nights, but his smile was still as infectious and his eyes clear and expressive. It took him a while to make it to New Zealand, although Melbourne is just across the pond. It transpired he had to get a special travel permit because he was serving a suspended sentence. I never asked him what his crime was. In a strange way I was happy to hear he was still “active”. The detail only added to the mystique and the legendary status he enjoyed in my book. A quick glance at the map of my last two decades will testify to my every effort to do justice to the name I inherited. To this day I catch myself looking with some inexplicable longing at displays listing departures to destinations other than mine. Why not Kathmandu instead of Munich? Today I live in New York, but Manaus, Darwin, Windhoek and countless other obscure places continue to beckon. As my son Tarik sets off on another trans-Atlantic trip, and my daughter Azra prepares to depart for London to live and study for the next several months, it is in their excitement and absence of the slightest whiff of anxiety that I see traces of that inextinguishable fire. The prospect of a journey alights the same glimmer in their eyes as that of the adventurer leaning over the bar in Melbourne’s harbor with a cigarette hanging from the corner of his mouth. 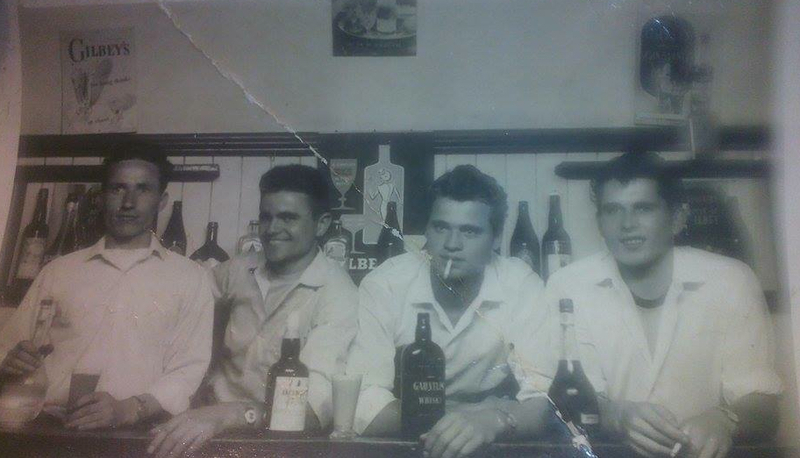 Refik, second from the right, with Dzemal (to the left of him) and their two Irish partners at a bar they ran in Melbourne during the sixties. thank you for putting this story together. when a family moved countries in the past it was always hard or impossible for relatives to hear such stories as this. Djemal described their get away from Bosnia as 4 days of running and hiding in forests to escape conscription. when he returned with Jenny he was nervous that he might be forced into the army. The main reason for returning to Bosnia was to build a bigger hour for his extended family.